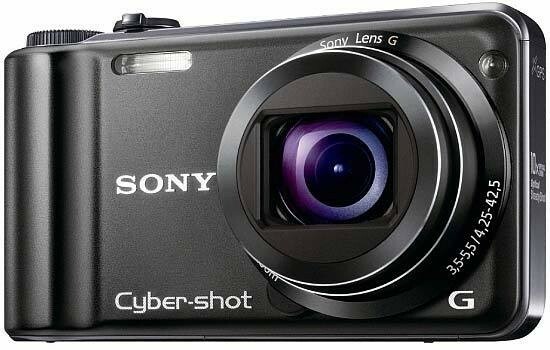 Reviews of the Sony Cyber-shot DSC-HX5 from around the web. Like most of its peers the HX5 is designed more for practicality than for style, but it's still a good looking camera, and is available in black or silver. It has an all-metal body which is rather box-like, but which has a rounded grip moulded into the right-hand end making it very comfortable to hold. It's quite small by long-zoom compact standards, measuring 102.9 x 57.7 x 28.9mm and weighing 200g including battery and memory card. Sony's Cyber-shot DSC-HX5 is the company's first truly pocketable super-zoom camera. Announced in January 2010 it features a 10x optical zoom with impressive wide-angle capabilities, Full HD video recording, very fast continuous shooting, a built-in GPS receiver which records your position, altitude, compass heading and local time onto images, and a 10 Megapixel CMOS sensor which claims great low light performance. Sony's earlier Cyber-shot DSC-H20 may have also sported a 10x zoom, but it wasn't anywhere near as small, nor did it share the HX5's impressive array of additional features. The Sony Cyber-shot DSC-HX5V ($349) is a compact ultra zoom camera with several features that differentiate it from most of its competitors. They include a back-illuminated CMOS sensor, which promises better-than-average low light performance and super-fast continuous shooting, plus a built-in GPS, unique sweep panorama feature, and 1080i HD movie recording. That's on top of the 10X, 25 - 250 mm Sony "G" zoom lens, optical image stabilization, 3-inch LCD, limited manual controls, HDMI output, and support for both Memory Stick Duo and SD/SDHC memory cards.